In less than a month, Men of Foxwick will be released. The release date is June 17, 2013, and I could use some help promoting the release of my fantasy short story collection. I don't want to do a major blog tour or anything like that, but I thought it would cool to do a cover reveal/promo post. If you're interested, all you would have to do is sign up. Then, I'll send you a document before the release date, so you can choose between a small, medium, or long post to post the week of June 17th. It's as simple as that, and I would be forever grateful. Men of Foxwick will feature five short stories involving men from Foxwick. A blind teen seeks a place in the kingdom. A dragon seer journeys to Wintermill to spy on the queen. A sword master's worst fear comes true when he fails to protect the royal family. A king falls in love with an herb witch, but will she feel the same way? A hunter will rise to the challenge to hunt down a man-eating monster. 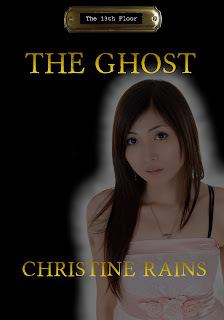 And now we have the cover reveal of The Ghost, the last book in the 13th Floor series by Christine Rains! Chiharo Black lives with six supernatural tenants in a haunted building's mysterious thirteenth floor. Of course, no one knows she's there except the cats. Being a ghost can be a bit frustrating and lonely, but it isn't as bad as her mother made it out to be. Until another ghost intrudes on her territory. Jeremy Emerson wants revenge on the vampire that killed him and won't stop until he has it. To top it off, a nightmarish shade sneaks in and leeches the energy from the building's residents before setting its sights on Chiharo and the thirteenth floor. She can't decide which one is more frightening: the one wanting to eat her soul or the one who might win her heart. Chiharo must convince Jeremy to stand with her against the hellish parasite. If they cannot work together, the greedy fiend will not only drain their energy but everything that supports the thirteenth floor's existence. About the Author: Christine Rains is a writer, blogger, and geek mom. She has four degrees which help nothing with motherhood, but make her a great Jeopardy player. When she's not writing or reading, she having adventures with her son or watching cheesy movies on Syfy Channel. She's a member of Untethered Realms and S.C.I.F.I. The 13th Floor series is her first self-published series. She has seven novellas and twenty-one short stories published. 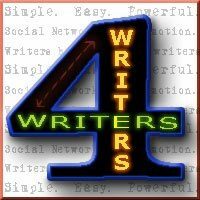 Writers4Writers has two more fabulous authors to promote today. Go to Laura Eno and Marian Allen's blogs for tweets and Facebook posts and find out more how you can support them! Thank you for helping with my cover reveal. And for shouting out for W4WS! I'm excited for MoF! I like that cover, it is simple but eye catching, I like covers like that. Oh yes, and I agree with you. Mexican Lassie was fun, but I like really Lassie more too. Congratulations Christine and be glad to help with the reveal! Congratulations to both you and Christine! Book releases are always very exciting. Congrats on MoF coming out in June. Thanks for stopping by to help make Rachel's day special. I can help you out with a cover reveal promo on the 17th. But we're leaving on the 28th for Italy so I can only leave the post up for a few days as I want to get a post in before we fly. Let me know if this works for you. Happy to sign up. And another cool cover for Christine! You and Christine are amazing! Count me in for the book release. Congrats to both of you on your releases. Both sound like fun reads. Cherie, I'd be happy to host if you still need anyone. Looks like you're getting lots of help. Sorry but I'll be on vacation. I feel so behind lately! I missed Christine's cover reveal. Count me in for Men of Foxwick! I've seen Christine's cover around this week. Excellent! I goodreaded (is that a word? it should be) and signed up for your cover reveal. This is all new for me, and I'd love to help. I would love to create one of my signature, special intro for your new collection.